The future of Indigenous radio and media in Canada shifted dramatically on June 14 with the CRTC’s awarding of Indigenous radio licences in five of the country’s most populous cities. “Literally my heart broke,” John Gagnon, CEO at Wawatay Native Communications Society, told the audience at the Future of First Nations, Inuit, and Métis Broadcasting national convergence the following day in Ottawa. Wawatay, a northern Ontario broadcaster and publisher in operation since 1974, had applied for licences in Toronto and Ottawa, but those were awarded instead to First Peoples Radio, the Aboriginal Peoples Television Network’s new radio initiative that had applied for licences in all five cities. The CRTC’s decision gave the Vancouver licence to Northern Native Broadcasting (Terrace B.C. 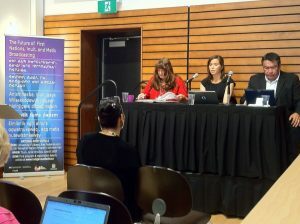 ), and the Edmonton and Calgary licences to Aboriginal Multi-Media Society of Alberta. * Sidenote: see posts on NNB(Terrace)’s CFNR and AMMSA’s Windspeaker for those companies’ responses to being successful in their applications; they were not interviewed for this article. In an interview (full audio below), APTN’s CEO Jean La Rose stated, “We were trying to avoid … what happened in the final decision – trying to partition it to everybody to hopefully make it work for everybody but at the same time making it more of a financial challenge”, expressing his disappointment that FPR wouldn’t be able to offer everything they’d hoped to as a five-city national Aboriginal radio network, but affirming “we understand where the commission came from and we’ll do our best to make it work” with only the Toronto and Ottawa licences. He expects to have the stations operating within 8-10 months, if the CRTC approves the modified programming that will come with having less than half as many stations as their plan was based on, and states that APTN / FPR will still do all it can to build a national radio network over the longer term. The CRTC stated they didn’t think Wawatay’s proposed economic model was sufficient, with high programming expenses, not enough advertising, and too much reliance on non-yet-solidified ‘third-party’ funding. They may also have been influenced by Wawatay’s financial struggles of a few years ago. Yet the CRTC over-ruled APTN’s submission of a “non-severable” condition on their five-city network proposal, offering confidence that two FPR stations could still operate successfully on their own. APTN had submitted that the bare minimum they’d need to offer their proposed programming would be four stations, including both Vancouver and Toronto, otherwise their news, spoken-word, Indigenous language, and local content would probably not live up to the plans in their application. 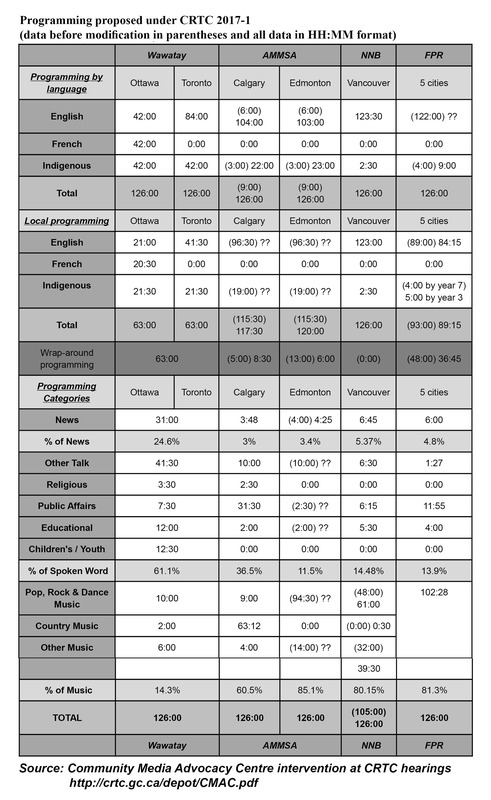 Wawatay’s proposals had by far the highest amount of Indigenous languages programming and diversity amongst all the applicants, with 42 hours weekly (second most was AMMSA with 23 hours, and then APTN with nine and NNB with two-and-a-half). Wawatay and APTN both proposed offering content in Ojibwe and Cree for Toronto and Ottawa; APTN also proposed Inukitut for Ottawa and Mohawk for Toronto, while Wawatay also had Inuktitut, Mohawk, Algonquin, Oji-Cree, and Michif for both cities. The Truth and Reconciliation Commission’s recommendations include (14.iii) “The federal government has a responibility to provide sufficient funds for Aboriginal-language revitalization and preservation” and (14.v) “Funding for Aboriginal language initiatives must reflect the diversity of Aboriginal languages.“ This would seemingly fit with Wawatay’s economic model relying more heavily on ‘third-party’ funding for their higher levels of languages programming. Canada’s Minister of Heritage Mélanie Joly opened the Future of First Nations, Inuit, and Métis Broadcasting national convergence June 15 with a 10-minute speech focused primarily on support for Indigenous languages, leaving 25 minutes for engagement with the convergence participants. The first question was regarding the CRTC decision; Joly responded by noting that the outgoing CRTC chairman’s mandate from the previous government didn’t necessarily include anything specific on reconciliation or Indigenous languages, but that the mandate she would be giving the new chair would include both as priorities. She stated that although her ministry governs the CRTC, it is an independent body with licencing decisions not subject to her approval. The issue of Indigenous sovereignty and self-determination, in the context of ‘nation-to-nation’ relationships and Indigenous media policy, was also brought up during the CRTC process. But it seems to have not been considered in the CRTC decision, with not one instance of the word ‘sovereignty’ appearing in its full document. Interventions from Indigenous political bodies that asked the CRTC to give the Ottawa and Toronto licences to Wawatay came from representatives of the Chiefs of Ontario, Union of Ontario Indians, Nishnawbe Aski Nation, Grand Council Treaty #3, and Shibogama First Nations Council, while only two First Nations – Alderville and Temagami – in Ontario supported APTN’s application (the Metis General Settlements Council supported both Wawatay and APTN). Without any formal accountability, the CRTC was able to ignore any or all of these requests as it saw fit. During the hearings, CRTC chairperson Jean-Pierre Blais noted and apologized for the fact the CRTC has no Indigenous people involved in making the decisions, but that it is not the CRTC itself that chooses who its commissioners are. *Sidenote: The only person of colour who would have had a say in the CRTC’s decision – Raj Shoan, Regional Commissioner for Ontario, who’d been fired in June 2016 – had a Federal court verdict in April finding ‘unfair dismissal’ and ordering reinstatement, only for him to be quickly re-dismissed, which he is also challenging in court. The CRTC process to re-allocate these licences drew criticism for pitting the national TV station APTN’s application for a new radio company against the three established regional broadcasters, who hold seats on APTN’s board of directors. Chairman Blais commented at the public hearings that the CRTC had hoped the different organizations would have come together with a unified pitch, but the CRTC process was criticized for not allowing enough consultation or opportunity for collaboration. Wawatay’s Metatawabin and Gagnon expressed their optimism for the possibility that the CRTC decision could be changed or challenged, and that Wawatay may still obtain licences to serve Toronto and Ottawa. Gagnon also commented on the damage to the company’s reputation and business caused by the CRTC decision, noting how companies of foreign countries are allowed to sue under trade agreements like NAFTA when Canadian state policy impacts their business negatively. Disclaimer: The author presented an independent intervention in this CRTC licencing process, in favour of Wawatay’s applications. The intervention is available for listening and/or reading here. ** Note that this article is co-published with Anishinabek News. It has been revised since it was originally published, last updated at 7:55am June 19 2017. – archived materials from the regional gatherings held in the lead-up to the national event are also available on the website, along with additional resources. The convergence’s main aim was to bring together people in the Indigenous Broadcasting sector in so-called Canada to discuss and organize around collaboratively engaging with the CRTC’s upcoming review of its Native Broadcasting Policy. Wawatay’s president Mke Metatawabin with other panelists Banchi Hanuse (C) and Monique Manatch (L) at the Indigenous Broadcasting convergence June 15 2017.